MOSCOW (Reuters) – The Russian rouble sank to its lowest level since early June 2016 on Friday, battered by concerns over the impact of new U.S. sanctions, falling oil prices and a broadly stronger dollar. The rouble briefly hit 67.67 against the dollar, losing around 6 percent of its value since the start of the week on U.S. sanctions fears. “The Russian currency has been caught in a perfect storm of weakening crude oil prices and the new US sanctions, in addition to the threat of even tougher punitive measures in the coming months,” said Lilit Gevorgyan, an economist at IHS Markit. The United States announced new measures on Wednesday targeting Russia that pushed the rouble sharply lower and sparked a wider sell-off over fears Russia was locked in a spiral of never-ending sanctions. 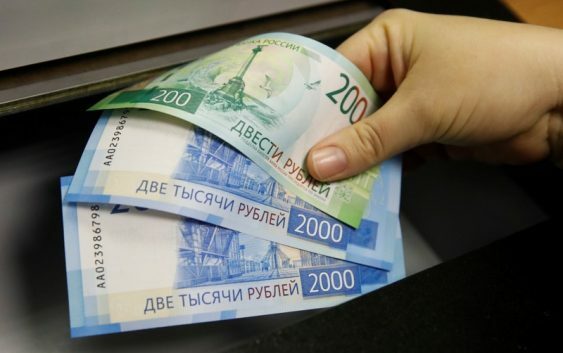 In attempt to lift some pressure from the tanking rouble, the central bank cut its foreign currency buying on Wednesday. Analysts doubt, however, that authorities will take much action to support the falling rouble, as they decided not to intervene during a similar sell-off in April, which was also driven by U.S. sanctions. At 1457 GMT the rouble was 1.1 percent weaker against the dollar at 67.43 <RUBUTSTN=MCX>. The Russian currency had gained 0.1 percent to 76.98 versus the euro <EURRUBTN=MCX>. As the Turkish lira sent tremors through the emerging markets by hitting all-time lows, analysts at Rosbank said the rouble was hit more by the situation in emerging markets than by concerns about new sanctions. Looking forward, the market was betting on the rouble to regain some ground. Konstantin Kostrub, head of trading operations at ING Commercial Banking in Moscow said he expected the rouble to stabilise around 66.00-67.00 per dollar in the near future. The rouble could recover if the flow of news about sanctions tapers off, but a further rouble drop to 68 per dollar cannot be ruled out, said Denis Davydov, economist at Nordea Bank in Moscow. Russian stock indexes were also hit by sanctions and investors’ efforts to minimise exposure to Russian assets. “The Russian equity market and the rouble have been hit for the second time since the start of 2018, highlighting the significance of geopolitical risk for investors in Russia,” Gevorgyan from IHS Markit said. The dollar-denominated RTS index <.IRTS> was down 3.2 percent to 1,062.4 points, its lowest level since April 11. The rouble-based MOEX Russian index <.IMOEX> was 1.7 percent lower at 2,269.9 points. Moves in stock indexes were exacerbated by a proposal by a Kremlin economic aide to raise more revenue for the state from metal and mining companies. The letter, seen by Reuters, lists Evraz <EVRE.L>, NLMK <NLMK.MM>, Nornickel <GMKN.MM>, Severstal <CHMF.MM>, MMK <MAGN.MM>, Mechel <MTLR.MM>, Alrosa <ALRS.MM>, Polyus <PLZL.MM>, Phosagro <PHOR.MM> and Acron <AKRN.MM> among those the state could target. “Since the weight of these sectors is about 12 percent in the MOEX index, the pressure is noticeable,” analysts at Raiffeisen said in a note. President Vladimir Putin has ordered that the proposal deigned to raise 500 billion roubles ($7.5 billion) a year from metal and mining firms be looked at, but no decision has been made yet. “Until additional explanations on the potential measures are announced, investors will prefer to refrain from buying metals and mining stocks,” Raiffeisen said.